Whenever possible I like to write my own code instead of using a library (at first). It's a challenging puzzle and often times I learn how to do something useful as well. Most recently I got a 128x64px LCD to use with an Arduino micro-controller, the display could show graphics but its built in text mode was very limited, so after getting the graphics mode running I set about building a way to turn strings into text on my display. My basic plan was to store a bitmap of each letter and its width in an array so that I could look it up and read it back as x/y pixel locations. In order to keep my program as small as possible I had to choose the type of data I used to store the letters so that there would be very little wasted space while also being easy to maintain and update, eventually I settled on storing each letter as a 32bit integer. Unfortunately for me, C/C++ doesn't allow integers to be expressed in binary format if they are longer than 8 bits so I had to write a small program using Processing.org to scrape all the strings of ones ans zeros from a text file and then convert them into integers so my final value for storing the letter "A" ended up being 464332680. Afterwards I pass the letter's width back to the string handling function so that I leave the appropriate amount of space between the letter I just printed and the one that comes next. Once this was working I used one of the three trailing zeros to indicate if the letter was a lowercase that needed to descend below the normally lowest pixel. The results are satisfactory given the small size of the display. While working on another BasicStamp project I found that I needed to store a lot of short sequences of instructions, specifically the addresses of the custom characters needed to to draw big fonts on an alphanumeric display. Each big font letter is 2 blocks tall and between 2 and 4 blocks wide, each of those blocks can be filled with 1 of 7 custom characters, a blank space or a completely filled block. Its possible to just write a subroutine for each letter, but that would mean a lot of copying and pasting of code and I would have to find a way to convert the string I want to write into a series of subroutine calls. In the interest of keeping my code short and making things modular I settled on using 2 subroutines to write strings of big font letters to the screen, the first one takes a string of 1-5 characters and looks up their character writing instructions and handles spacing on the screen. 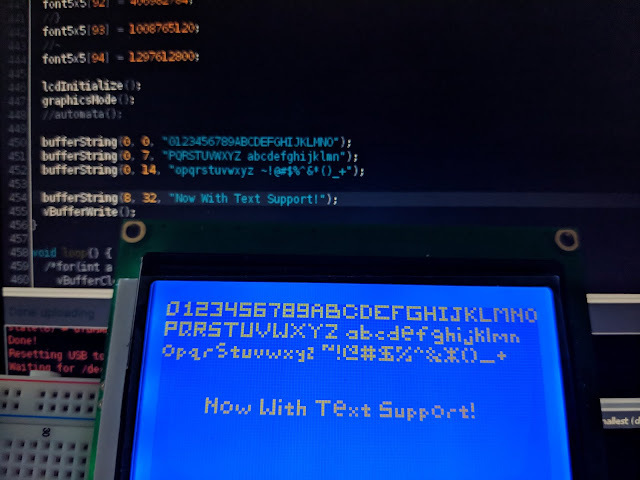 The second subroutine takes the character writing instructions and uses them to actually write custom characters to the LCD in the correct place. The character writing instructions are 5 to 9 digit (base 10) integers, the first 4-8 digits are the custom character codes (0 = top left corner, 1 = top right corner ... 6 = lower bar, etc) in rights to left, top to bottom order, followed by a single digit that indicates the width of the big font letter (e.g. 0124563 where 3 is the big letter's width). To make them easy to look up, each code is stored in an array with an index equal to the value of each letter's ascii code ("A" = 65, "B" = 66...), that way I can take letters from a string, convert them to their ASCII code and use that value to look up the big font instruction. So now that I had a way to turn a string of characters into a series of instruction codes I needed to be able to dissect the codes, one digit at a time. 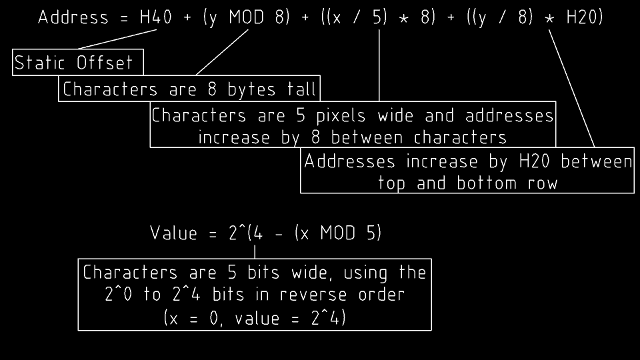 Had I used HEX values instead of base 10, I could just bitmask 0F to read out the least significant digit and then bitshift to the right by 4 bits to get rid of the current digit and move the rest down one place. But, had I used HEX values the 4 character wide letters' instructions that were larger than could be stored in an integer on the BasicStamp. So I went with base 10 numbers and ended up finding a more universal solution to the problem of taking apart an integer written in any base. To get the value of the least significant digit I use the modulus function, MOD 10 in this case, then I get the quotient (division without the remainder or decimal) of the integer and 10 to shift all the digits to the right while dropping the current "ones" digit. By using this approach I can create new big font letters by simply adding entries to the charCode array and I have avoided having dozens of subroutines to cover each letter. As my first microcontroller project I decided to make a hand-held clone of the classic game Pong. Normally a graphical display would be required for this kind of project but I decided to take advantage of the custom character capabilities of the readily available 1602a LCD. 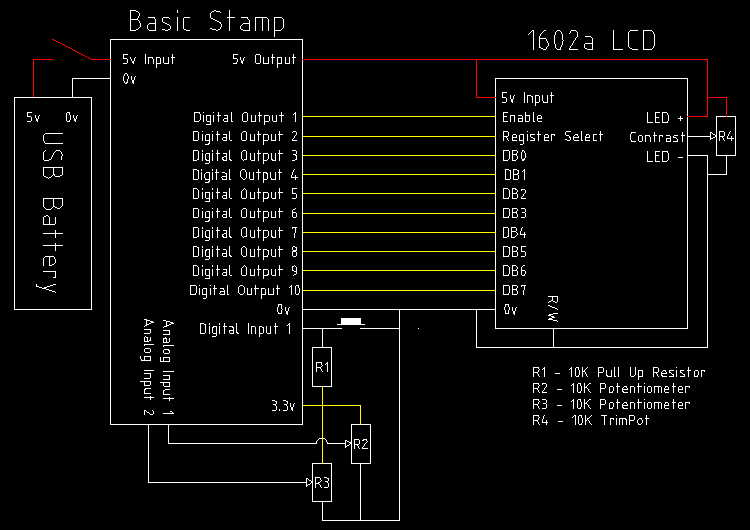 The core of the project is the updated Basic Stamp from Coridium which based on the LPC11u37 ARM microcontroller, software for the stamp is written using an updated version of basic which is very similar to the first language I had learned, Qbasic. 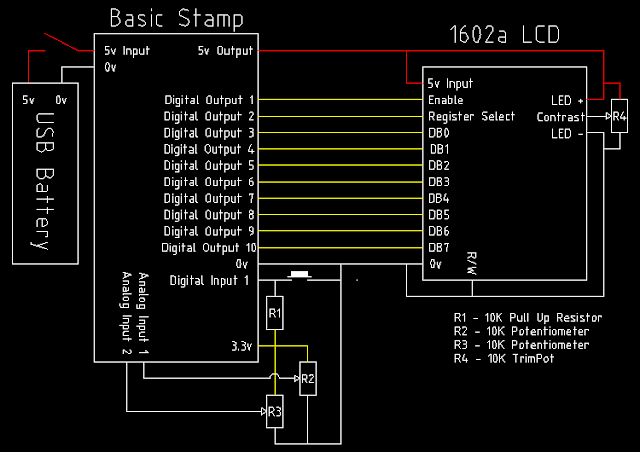 The wiring diagram below shows how I connected the Basic Stamp to the LCD and three inputs needed to play the game. 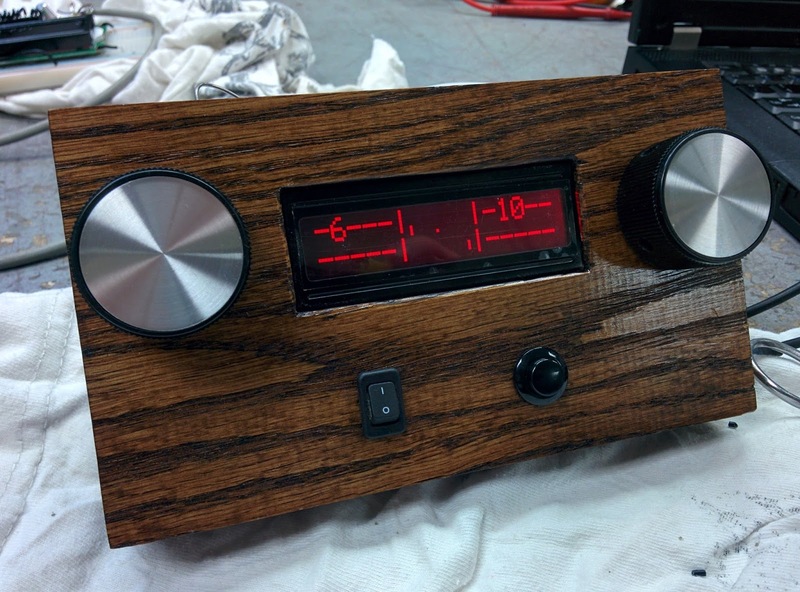 The pushbutton with the pullup resistor R1 is used to make selections and progress through the small menu system, R2 and R3 are the potentiometers that return a 0 to 3.3v signal used to control the paddles and change selections in the menu. The 10 digital outputs are used to interface with the LCD using it’s 8-bit parallel mode, R4 is a small trimpot used to set the contrast of the display. The contrast makes a big impact on how clearly the ball’s motion is visible but only needs to be set once. Finally I used a USB battery as the power source for the project, this takes care of charging the battery and providing a stable 5v supply for the microcontroller. With the project wired on a breadboard I could start laying out my program, the flowchart below shows how the final version of the software turned out. 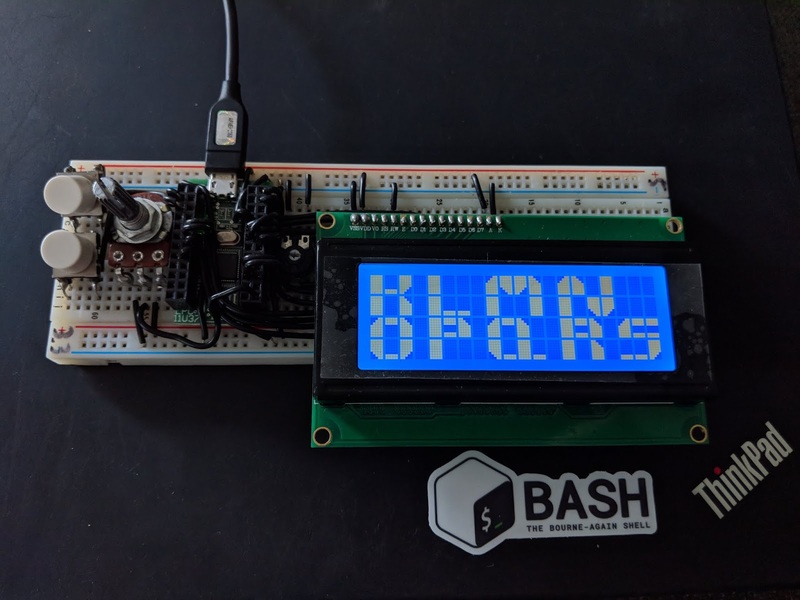 After being powered on there are a few tasks that only need to be done once, like sending commands to the LCD to get it started and initializing all the global variables used in the game. After the PONG splash screen is shown the user can press the button and is presented with a choice between One and Two Player Modes, to get this input I look at the current value of the analog input for the right hand potentiometer. 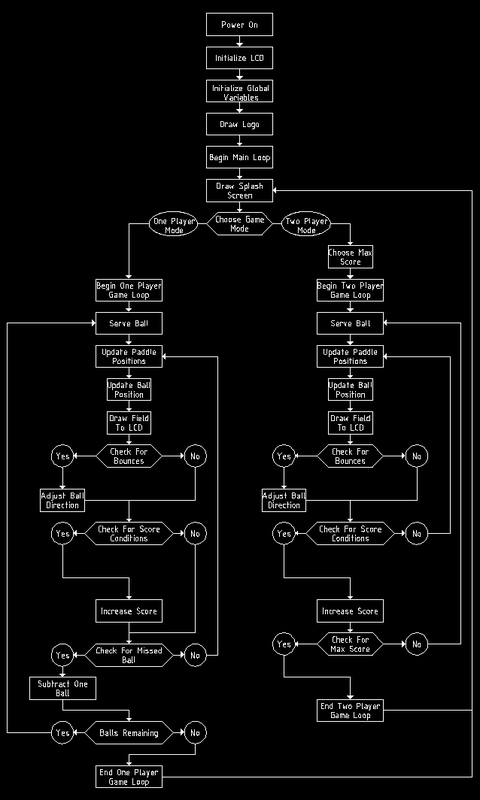 If the analog input is greater than half of 65472, the maximum input value, then One Player Mode will be selected when the button is pressed, if the analog input is lower than half the maximum value then Two Player Mode is selected. For a single player the game now begins but for two players there is an additional step, picking the maximum score for the round. I wanted a range from 10 to 50 using increments of 5 and came up with the following line. "65472 – AD(1)" was used to reverse the direction of the input to make clockwise motion of the potentiometer increase the score, the result will still be a number from 0 to 65472. Multiplying the 0 to 65472 value by 9 and then taking the quotient of that value and 65480 (slightly larger than the maximum) results in integers from 0 to 8. Multiplying that integer value by 5 and adding it to 10 turns the 0 to 65472 input from the potentiometer into a 10 to 50 output with evenly spaced increments of 5. Once the game has started in either One or Two Player Mode the logic is very similar. On every cycle of the game loop the position of the paddle(s) is updated by checking the value of the analog inputs and scaling them to a value from 0 to 16 (the usable height of my display) using the same method used to pick the max score. 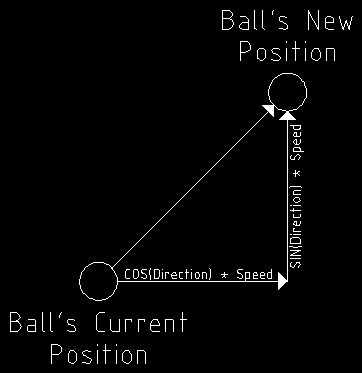 Next the ball’s position is updated by adding COS(BallDirection) * BallSpeed to the current X coordinate and SIN(BallDirection) * BallSpeed to the current Y coordinate, by storing the ball’s coordinates, direction and speed as floating point numbers I was able to get much smoother movement of the ball than if they were all integers. 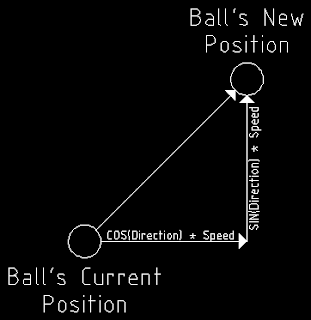 Instead of cogging from one pixel to the next the ball moves smoothly and it’s position is rounded to an integer only when being displayed on screen. After being sent to the display the game checks if the ball should bounce off of any of the walls or paddles and adjusts the direction accordingly. In One Player Mode bounces off the far wall increase the players score, if the player misses the ball with their paddle they loose a ball, in Two Player Mode getting the ball past the other player’s paddle increases the score up to the chosen maximum. If the ball is to be served on the next loop because a player missed a bounce then then a variable called gameState is set to indicate that a serve is needed and towards which player the serve will go. If the gameState variable is left untouched then the game continues as normal by updating the paddle position, ball position and then drawing it on the LCD. If the button is pushed or one of the ending conditions is met the game loop ends and the player(s) are returned to the splash screen by the main loop of the program. The majority of the program is handled using simple math, loops and if statements but interfacing with the LCD was a big challenge for me. The LCD takes information as 8bits on 8 DB pins as well as a Register Selection pin which determines of the 8bits of data is a command or data to be written to the LCD’s memory, finally there is an enable pin which is toggled to indicate to the LCD that the current input values are valid. In order to quickly set the values of the 8 DB pins I had to learn about Bit Masking, this is where you perform a logical AND function on your data byte and a mask. For example, if I want to know the state of the x bit in this byte 0000x000 I can perform a logical AND between it and 0000100. Because all of the undesired bits in the bitmask 00001000 are zero they will always result in a zero, the value of x will however be in the result because x AND 1 = x. By using a different bit mask to check each bit of the byte I want to send I could determine which DB pins should be on and which should be off. Where B is the byte of data I want to send then the value of each DB pin could be determined in the following way. When turning an output pin on or off in Arm Basic applying any non-zero value will turn the pin on so it doesn’t matter that the pin I use for DB7 will be told “OUT(DB 7 pin) = 10000000,” the pin will always be on when that bit is on. The other big hurtle was to take the xy data of the ball and paddle positions and translate them into something that was compatible with how the LCD works. Being an alphanumeric display it is only made to show characters from it’s ROM and 8 custom characters that can be programmed by the user. These 8 custom characters are 5 pixels wide and 8 pixels tall, by arranging them in a 4 wide by 2 tall grid it is possible to create a 20x16 pixel graphical display with room for score keeping (and debugging) on either side. 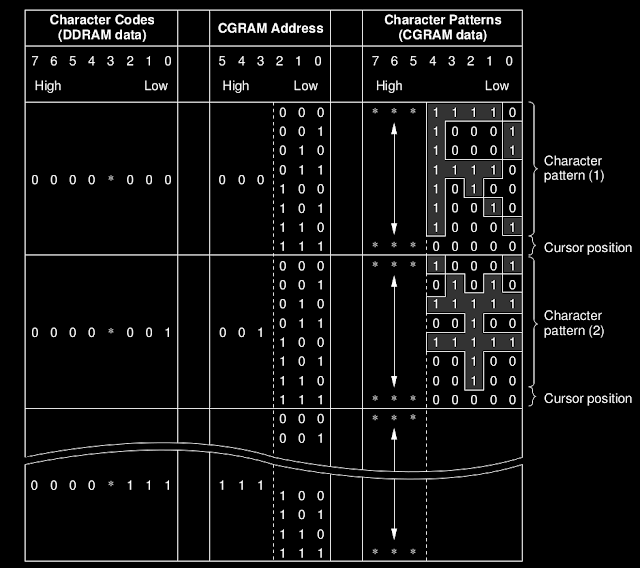 Each row of a character has an address (the CGRAM address) and shows the state of the 5 lowest bits of the byte stored at that address. So my 20x16 area is split up into 64 addresses with each address containing 5 pixels each. By mapping out the locations of the addresses I was able to make a pair of functions that would return the CGRAM address and the value of the byte that should be stored in that address for any given x and y pixel position, I could then write this byte to the appropriate CGRAM address and display the playing field. For a more detailed explanation of the functions I used you can check out a video I did on the subject linked here: Bit Mapping on the 1602a. Finally after about a month of development and testing I was ready to box up my portable Pong project in a suitably retro looking enclosure and call it complete. Dry ice is a great material to have in a shop that can be a workable stand in for liquid nitrogen in most cases. When left unattended for a couple minutes water in the air will freeze on the dry ice's surface and form a furry coating. After the dry ice has completely sublimated the water ice begins to warm up to room temperature and melts a few seconds later. Normally the water ice crystals are so small that they appear to be a uniform fur but putting a small grain of dry ice under the microscope shows how complex the growing crystals really are.